US Secretary of State Mike Pompeo has met with Hungarian Foreign Ministry Peter Szijjarto in Washington. During the meeting, Pompeo noted the necessity to support Ukraine in countering Russian aggression. This was reported by the US Department of State. 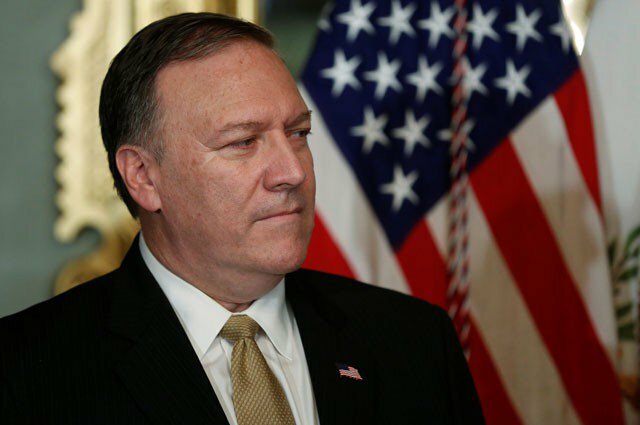 “Secretary Michael Pompeo met with Hungarian Foreign Minister Peter Szijjarto in Washington on Wednesday. The two discussed areas of mutual interest and opportunities for our countries to increase cooperation. The Secretary underscored the importance of maintaining a vibrant civil society. The Secretary also emphasized the urgent need to help Ukraine in the face of Russian aggression, including the importance of facilitating and supporting Ukraine’s engagement with NATO, and the need to counter Russian malign influence in Central Europe. Both sides agreed that Europe should diversify its sources of energy and discussed increasing U.S. investment in Hungary. The Secretary and Foreign Minister committed to concluding a Defense Cooperation Agreement in the days ahead,” the message says. As it was reported earlier, US Secretary of State Mike Pompeo talked with Russia's Foreign Minister Sergei Lavrov on the phone about Ukraine and improving relations between Russia and the United States. "Secretary Pompeo and Russian Foreign Minister Sergey Lavrov spoke by phone today, their first conversation since the Secretary’s swearing in and the Foreign Minister’s reappointment. The two discussed issues and concerns related to the bilateral relationship, Ukraine, and Syria. Secretary Pompeo reiterated that though the United States seeks an improved relationship with Russia, achieving that will require Russia to demonstrate that it is prepared to take concrete actions to address our concerns, including interfering in U.S. domestic matters," the message says.